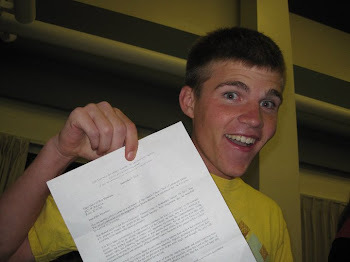 Elder Vaterlaus: Argentina Bahia Blanca: Goodbye America! This has been a great last week in America! It's gone by super fast because we have been busy with our teaching week! With this being the last week we have been having a lot of lasts in the MTC. Yesterday was our last day in four square and I totally rocked it! ha I am going to miss four-square but If i get to play soccer in Argentina every once in a while I'm not going to care one bit. We had a couple of meetings this week for departing missionaries. Nothing too special just a health meeting and a seminar about how to study our language while in the field. Our last service in the MTC was Wednesday and before we got our jobs (which was to clean chalk boards) there was a room next to us in the main building (so an employee) rockin out to Taylor Swift song Fairytale. It took all of my might to walk away. I miss T-swift.... but this is so much better! I can't wait for the airplane ride on monday! I already know that I am going to go and buy some Burger King and I can't wait to call you mom! I dont know but I always love traveling whether it be by car or plane so I am really excited to have a LONG flight. Its going to be awesome. The MTC has been one of the best experiences of my life. I have learned so much about my self and why I am here and why I am devoting two years of my life to this gospel. I have been so blessed these past 9 weeks. I have drawn so much closer to Jesucristo y Dios. And I have learned that they love me and everybody so much! I am so blessed to have this opportunity to go to Argentina to share what i Know. I have made life-long friends here at the MTC who have been incredible influences to me in my life. I miss you all and love you all, but I am so grateful for the opportunity I have to serve the Lord I love ya mom!